Bank of America ranks in the middle of the lenders that we reviewed. The lack of home equity loans and their complicated phone system hold them back from breaking into the top of the pack when it comes to lenders we reviewed. However, their live chat and educational resources are better than average, so they are still a good place to look if you are considering opening a home equity line of credit. Live chat on the website makes it easy to talk to customer service. 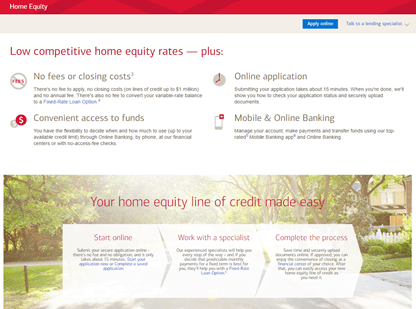 BoA only offers home equity lines of credit, not home equity loans. 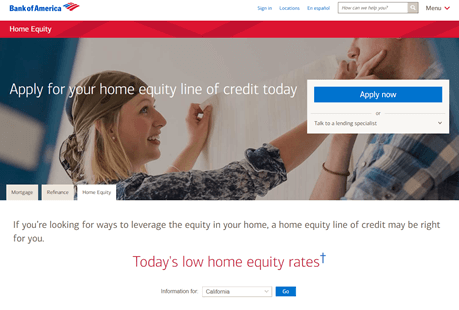 Bank of America has a number of useful resources, but these resources may or may not lead you to choose them to be your home equity line of credit provider. They stopped offering home equity loans in 2015, which makes it difficult to do a genuine apples-to-apples comparison to other lenders. Their customer service is inconsistent, being excellent on the website and in person, but less than stellar on the phone. As with most home equity lines of credit, you only pay on what you withdraw with Bank of America. You’ll pay interest during your draw period, and the interest rates are variable. You can fix them for a period of time, but this might incur additional fees. The variable rate follows the prime rate, which provides a measure of predictability for your home equity line of credit. Bank of America’s rate cap is higher than that of many of the lenders that we looked into, which might make some customers nervous, but the rate hasn’t come close to approaching the cap for a number of years, and doesn’t seem likely to do so in the near future. Bank of American has some of the strictest loan-to-value ratio requirements out of all the lenders we reviewed, same thing with the debt-to-income requirements. However, they do not have a minimum required credit score, which makes them a good option for individuals who may have run into credit trouble in the past but have since developed a solid income and paid down some of their debts. Their website has helpful calculator tools to help you determine what kind of rate and eligibility you’ll have with them. As Bank of America does not provide home equity loans, it is hard to do an apples-to-apples comparison of them with other lenders. You will have to pay interest on your home equity line of credit during the draw period, which is standard for these types of products. You’ll also have to ensure that you understand your repayment schedule and fee structure to not fall behind on your payments. The customer experience with Bank of America is mixed at best. Their phone system was a nightmare to negotiate, and we were disconnected more than once. However, as one of the largest banks in the country, they have a number of branches that you can walk into and get help with your home equity line of credit. Another issue with the phone service was that the officer was hesitant to answer questions unless we were actively filling out an application. This can be frustrating for customers who are shopping around. However, the tools on their website can help you get the answers you are looking for without having to pick up the phone. Bank of America is a good choice to look into if you prefer to conduct business in person and are sure that you want a home equity line of credit instead of a loan. Their live chat features on the website were helpful, as were the tools the site offered.